A selection of signage we have produced. Alerts emailed to you by Warwickshire Police to advise you of incidents in the area where you live and rural incidents in the county. Gate signs stating you are a member of a police approved watch scheme. These signs are reflective so if someone is using a torch or vehicle headlights near your property where the sign is positioned, it will reflect back making it more prominent. For Farms and Rural Business, you can make an appointment with your local officer or co-ordinator to visit and have your property security marked using various products. It enables you to easily identify your property, deters thieves and if stolen provides a way to establish the owner and return it to you. 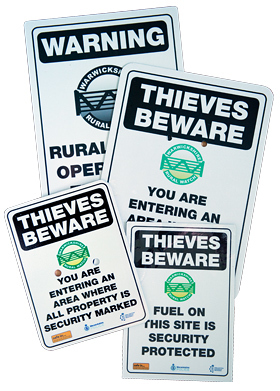 If your property is marked we will provide you with a reflective A4 and A5 sign to warn thieves your property is marked which is an effective deterrent.